Across the street from Golden Deli and Vietnam House is a pho restaurant I've neglected for quite a while, simply in part of the delectable food you can get at the former. 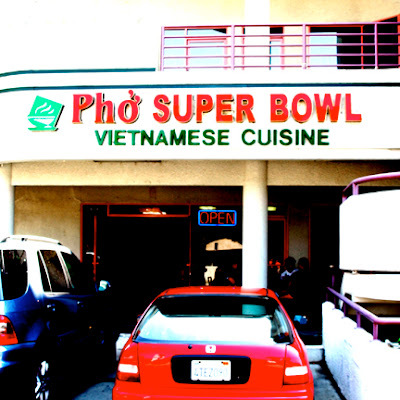 I drove by many times wondering what the food at Pho Super Bowl tasted. Many people know that Golden Deli serves some of the best pho and egg rolls (cha gio) in the SGV and given the three choices within the Las Tunas/Mission Dr area... how does Super Bowl sustain business? 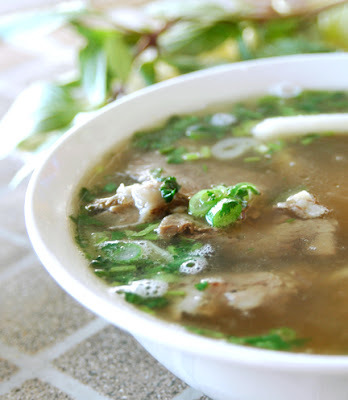 Simply because it makes a good bowl of pho. As I drove down, I resisted all urges to turn into Golden Deli and Vietnam House. Good boy, I kept driving straight and turned left into lonely shopping center. The place looked almost desolate with only a market and cigarette shop keeping PSB company. I walked in and decided to sit outside in the patio to get better camera lighting. Next to me, a man quietly slurped his noodles. I can see that he also ordered a side of egg rolls... the peanut butter & jelly combo of Vietnamese food. One cannot eat pho without egg rolls right? The problem with sitting outside is that you are more likely to be neglected, which happened to me. Took me a good 10 minutes to get recognized. This was my first time here so I had to go with the standard items.... Pho Chin Nam (brisket) and Cha Gio please. Before I even ate these, I knew they would be so so. 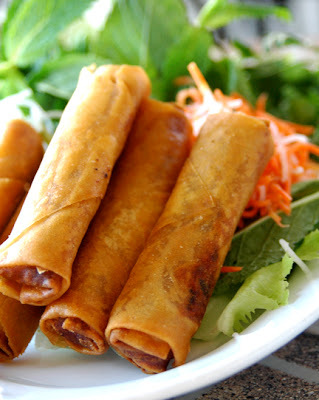 Any vietnamese restaurant that serves their egg roll with Chinese spring roll wrappers won't be the same. Traditionally rice paper is used to wrap the ground pork and when fried, the skin becomes crispy and blistered... promising maximum crunch with every bite. The Vietnamese that came during the 70s wave did not have access to rice paper and resorted to Chinese wrappers. The pork filling was very good and so was the nuoc cham (fish sauce dip). The egg rolls were also accompanied by a nice portion of lettuce, cold steamed noodles (bun), mint and pickled carrots/daikon. Overall very good... but god that skin! I actually did not get this type of pho. I forgot what I ordered, but I knew it was something like chunky flank which is even fattier. I took a whiff of the piping hot bowl and it really smelled great - very strong in cloves and less anise. The color was a beautiful light brown, like Golden Deli. The beef portions were very generous with at least 9 full pieces of brisket. Now for the broth test... mmm... very nice. This was a very good bowl of pho. A note to those looking out for their weight, this particular bowl of pho was slightly oily at the top which you can see in the image. But this probably in part of my order of chunky flank beef. The noodles were cooked the way I like them - slightly chewy and al dente. The soup stayed hot for a while because I did not add the bean sprouts in, which lowers the overall soup temperature. I don't eat pho like most people do... altering the color/taste of the soup with Sriracha and Hoisin sauce. 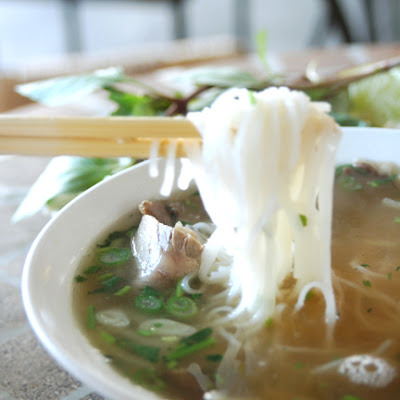 I want to know what the pho tastes like in its purest state. Overall, I enjoyed the pho here. PSB has a nice selection of meats to choose from, including the chunky flank and golden brisket (like Pho 79 on Garfield/Main). This is the advantage over Golden Deli, which doesn't serve golden brisket. And for many people I know, golden brisket is a must-have. The only con is PSB's egg rolls are not nearly as good as GD's. I would definitely go here again to let my friends and family test it out. So if lines are too long at Golden Deli or Vietnam House, PSB is a good alternative - it is NEVER CROWDED here. Who knows, you may even like it more. I know a few Chowhounders have crossed sides and stayed with PSB.